UPDATE 7/8/2018: The description of this successful foray has been saved here for historical and reference purposes. 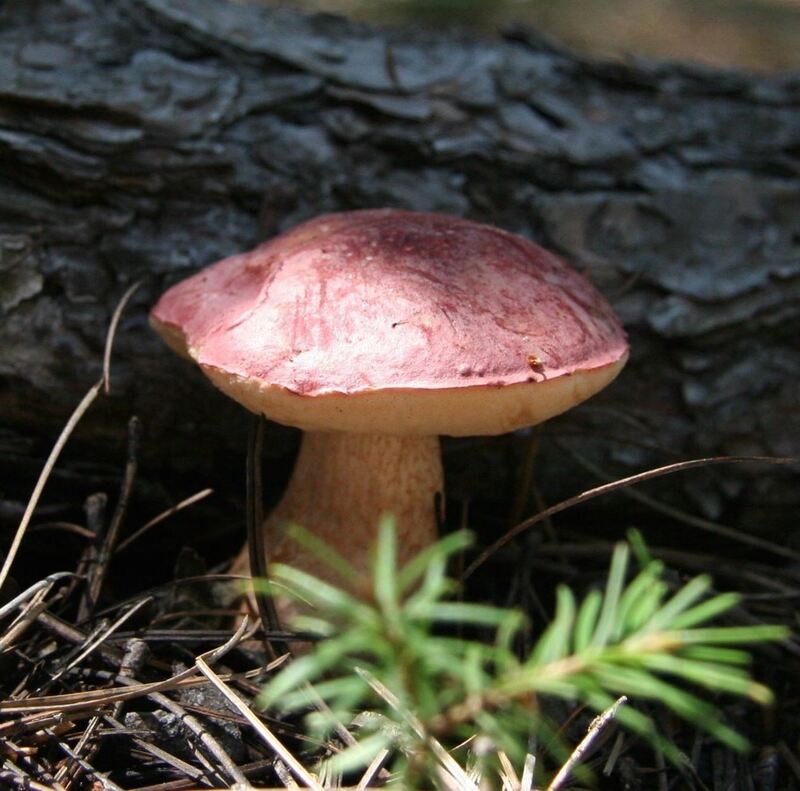 There is plenty of information about mushroom hunting in Arizona on this long page. UPDATE 6/3/2017: This foray has now filled. We regret that the number of spaces is limited, but you can put your name on the waiting list at the registration page. Perhaps you would enjoy coming to the AMS Annual Foray instead. The North American Mycological Association and the Arizona Mushroom Society, Inc., are pleased to announce that registrations opened on May 2nd for the August 2017 NAMA Regional Foray in Arizona. This event will take place at 9,000 feet elevation amidst the cool mixed-conifer forests of Arizona's White Mountains. If you think of Arizona as only dry desert, you may find it surprising, but fungal growth in our high mountains is diverse and exuberant in the wet monsoon season of late summer. Fungal fruiting is typically at its peak in early August. We look forward to welcoming you to our little-known but interesting corner of the mycosphere. If you have any questions, you may contact Chris May, the President of the AMS, at 480-326-6863 or via email. The foray will open on Thursday evening, August 10, 2017 and close at mid-day on Sunday, August 13. However, the Phoenix airport shuttle will also be stopping for short forays in the different biomes along the way to and from the meeting. Any "early birds" who are in town in Wednesday Aug. 9 are invited to meet at Salt Restaurant in Pinetop at 7:30 for an informal dinner. 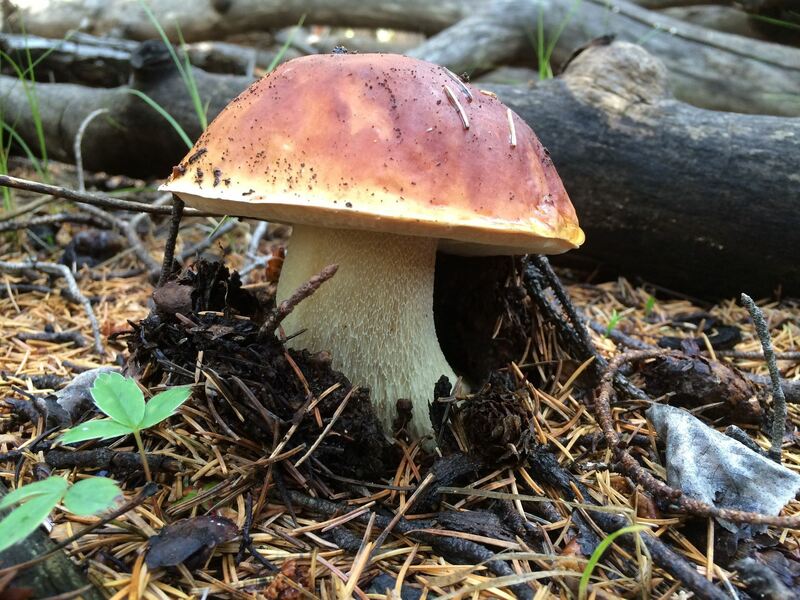 Those who want to make more extended forays before or after our organized event will find unlimited opportunities to do so in the vast national forests of northern and eastern Arizona, where no permits are required for harvesting mushrooms for personal use. 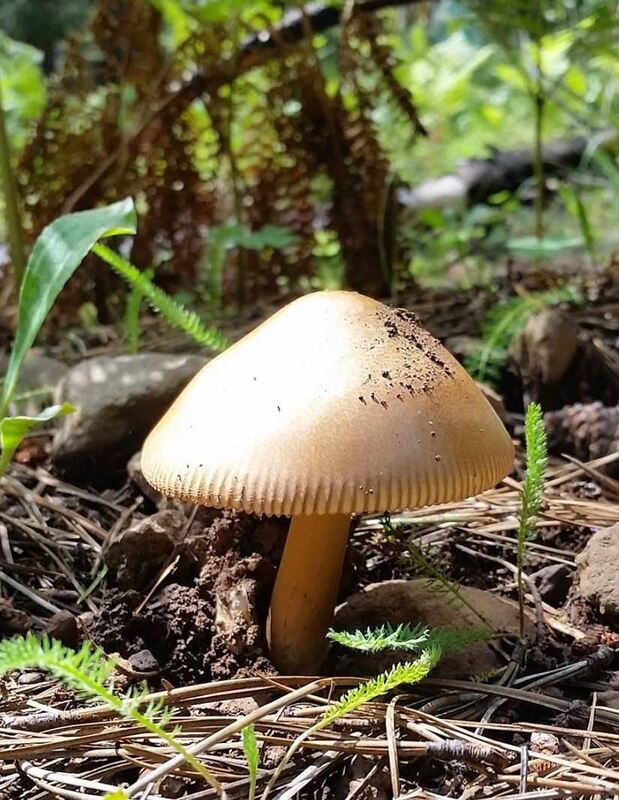 Our dates of August 10-13 are just a week before the famous Telluride Mushroom Festival, a half-day's drive to the north of our meeting location, which may appeal to those who wish to make a long trip out West. Deadline for submitting your registration and payment in full is 8/1/2017. After 8/1/2017, no lodging refunds will be issued. After 8/7/2017, no other refunds will be issued. The base registration fee for this event is $45. This price includes all of our forays, evening programs, workshops, cooking demonstration, and supplies such as collection slips and wax-paper bags. Space is limited to 75 registrants. Lodging, meal plan, and Phoenix airport shuttle charges are additional (see below). The average attendee who books a double-occupancy hotel room and full meal plan will pay a total of $284.50. Please note that you must be a member of the North American Mycological Association to participate in NAMA Regional Forays. Members enrolled as of May 2nd received a registration code by email directly from NAMA. This code is required in order for the registration page to be completed. If you are not a member, please join before registering for the foray. After you join, you can send a copy of your paid-up NAMA membership statement to the AMS President to obtain the code. Arizona Mushroom Society members, please note: This foray -- unlike all our other forays -- is not included with your membership dues, and you must join NAMA to participate. Our meeting will be held at the Sunrise Park Resort, near Greer. This 96-room hotel is owned and operated by the White Mountain Apache Tribe and has long hosted Arizona families who ski at the nearby Sunrise ski area. The standard lodging price of $181 provides a room with two full-size beds for three nights, taxes included. You can upgrade to two queen beds, a single king-sized bed, a jacuzzi room, or a suite, but you will need to negotiate any extra charges for upgrades directly with the hotel after you have received your registration confirmation. IMPORTANT: Only one person in your party should reserve a hotel room, unless you specifically want to reserve and pay for separate rooms. Additional guests who are included on your registration, or people who register for the foray individually but are sharing a room with another registrant, should choose the "Sharing a hotel room" option on the registration page. If you wish to find a roommate to share on expenses of a hotel room, you can indicate this on your registration or notify the AMS President. We will publish your name and contact information on the periodic email updates that will be sent out to all registrants before the foray. An RV parking space in the Sunrise RV Park can be reserved for $66 for 3 nights. You can also book a basic tent camping spot in the Sunrise Campground, costing $27 for three nights. Those who live locally, or have made other arrangements, need not reserve any lodging. Please note, we reserve the right to give priority to individuals booking a hotel room, until we reach the minimum number of rooms that must be filled to obtain our conference meeting rooms without charge. Pets permitted, with deposit. Note that pets will not be allowed in restaurant or meeting rooms. Pets may come on foray IF they are reliably well-behaved. Unsuitable pets will be disallowed at the sole discretion of foray staff. The meal plan covers a buffet breakfast, brown-bag lunch in the field, and dinner. The price is $149 for all meals from Thursday dinner through Sunday lunch. This price includes taxes and an 18% gratuity. The chef will accept vegan and other dietary requests when you register. There will be no additional charge for this, but NAMA and the AMS are not able to guarantee that the hotel can accommodate every request. The meal plan is not mandatory. Some attendees may wish to prepare or procure their own meals elsewhere, or purchase individual meals in the restaurant at a higher cost. Chief Mycologist: Scott Bates, Ph.D., Asst. Professor of Biology, Purdue University. 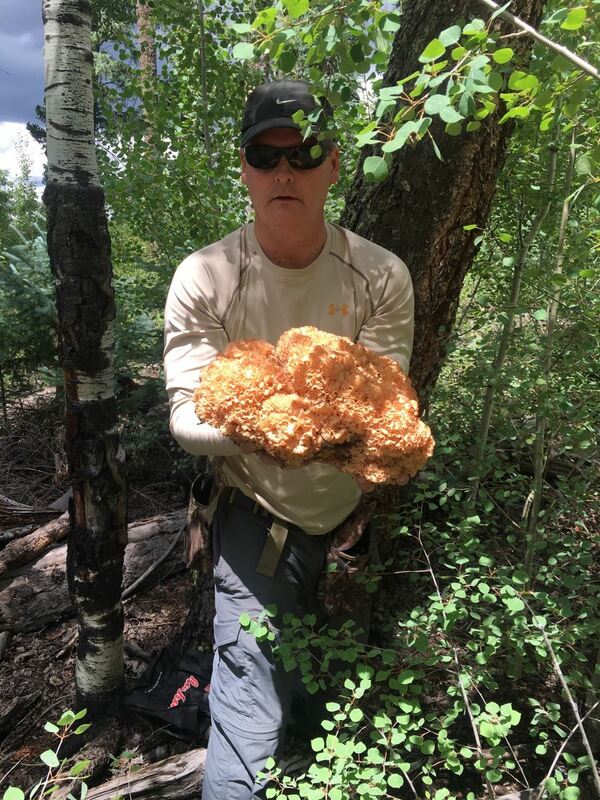 Dr. Bates is the creator of the Arizona Mycota Project, and one of the world's leading experts on the mycoflora of the Southwest, with a particular concentration on puffballs and other gasteroid fungi. Invited Mycologist: Rick Kerrigan, Ph.D., Director of Research at Sylvan, Inc. Dr. Kerrigan's recent book on Agaricus is the definitive modern reference to the genus. Instructor: Mary Smiley - Culinary and photography expert, multiple articles/photos published in FUNGI Magazine, contributor to Gary Lincoff's The Complete Mushroom Hunter, several Bessette/Roody books, Dr. Kerrigan's Agaricus book, and Mike Wood's California Mushrooms. Many of us know her as the administrator of the "Cooking with Wild Mushrooms" Facebook page. •1900: Early-bird private mushroom dinner with chef Jacob Ochsankel, cuisinier.jake@gmail.com. (Note that the dinner at Salt restaurant has been canceled). •1030 – 1600: Sonoran Desert/Piñon-Juniper foray. Van shuttle will leave at 10:30 from the Cell Phone parking lot near Phoenix Sky Harbor Airport Terminal 4, and attendees are welcome to convoy with us in their own vehicles. •2000: Mycological Lecture – Juggling Species Names In A DNA Era: What Does It Mean, Why Does It Matter? • 0800 – 1200: Piñon/Juniper/Manzanita Foray – Vernon. Leave from ROAD side of hotel. • 0800 – 1400: Spruce/Fir foray – Big Lake or Greens Peak. Leave from LAKE side of hotel. • 1230 – 1500: Local foray, mixed conifer. Van shuttle to nearby Forest Service land. • 0800 – 1200: Apache Reservation Photography Foray – Hawley Lake – Mixed conifer. Recreation permits must be purchased at General Store. 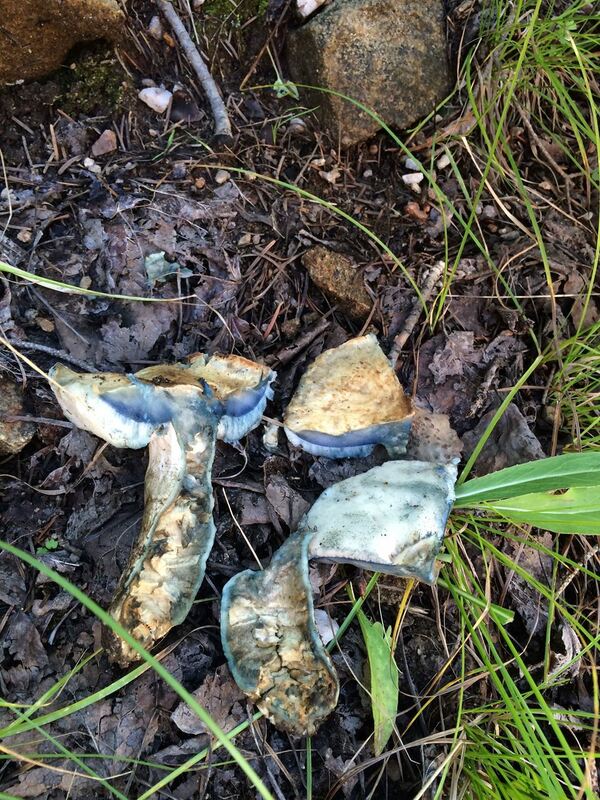 NO mushroom collecting on tribal lands. Leave from ROAD side of hotel. • 0815 – 1200: Ponderosa/Oak/Aspen foray – Vernon-McNary Road. Leave from LAKE side of hotel. • 1300 – 1500: Local walking foray, mixed conifer. Van shuttle to nearby Forest Service land. • 0800 – 1100: Local foray, mixed conifer. Van shuttle MAY be available. We will be guests on the homelands of the Apache people, who call themselves Dzil Łigai Si'án Ndee, or "People of the White Mountains." From the days when their ancestors depended for their lives on the bounty of these lush forests, to today's profitable tribal tourism, hunting, fishing, and timber enterprises, these forests have sustained the tribe since time immemorial. The Apache reservation lands are open to visitors who purchase a daily recreational permit. You will find a kaleidoscope of mushrooms in their enormous forests, perfect for photography, but be advised that mushroom gathering is not permitted on the Reservation and the fines for doing so are steep. In addition, certain areas of the reservation are strictly off-limits to those who are not members of the tribe. Tread lightly in this beautiful and sacred place. Adjoining the Apache reservation, there are many thousands of square miles of public land administered by the Forest Service, Bureau of Land Management, and Arizona State Land Department. Our group forays will take place on the Apache-Sitgreaves National Forest, by special-use permit. The Sunrise Park Hotel is located next to Sunrise Lake, near the foot of the Sunrise Ski Area. It lies on the east side of AZ-273 about 4 miles south of AZ-260, roughly midway between the towns of Pinetop and Springerville. The White Mountains are quite remote from the population centers of the Southwest. Our hotel is about 215 miles from Phoenix Sky Harbor Airport (PHX) and about 225 miles from Albuquerque (ABQ). Visitors who fly to one of these large airports can rent a vehicle for the trip, or take the Mountain Valley Shuttle from Phoenix. It is also possible to fly Boutique Air into Show Low Airport (SOW), about 30 miles from our hotel, but the flights are infrequent and costly. There will be a van shuttle from Phoenix Sky Harbor Airport directly to our hotel. We have 2 vans and spaces will be limited to 20 passengers. The Phoenix shuttle service will cost $45 round-trip. On the way up to the foray on Thursday, assuming that there has been sufficient rainfall at lower elevations, the van will stop at one or two places in the Sonoran desert and/or pinyon-juniper forest for fungal forays in these unique biomes. Returning to Phoenix on Sunday, the van will stop on the Mogollon Rim near Forest Lakes. This is a 7000-8000 foot escarpment where the ponderosa and aspen forests give way to Douglas fir, and is among the wettest places in Arizona. With some cooperation from Mother Nature, it will be a good opportunity for participants to gather fresh edibles for the return home. You will be able to reserve a space on the shuttle when you register, until all seats are filled. Elevations on or near the Apache reservation range from 3,000 feet up to 11,000 feet. This markedly varied terrain results in markedly varied biomes, as precipitation and vegetation mirror the differences in elevations. 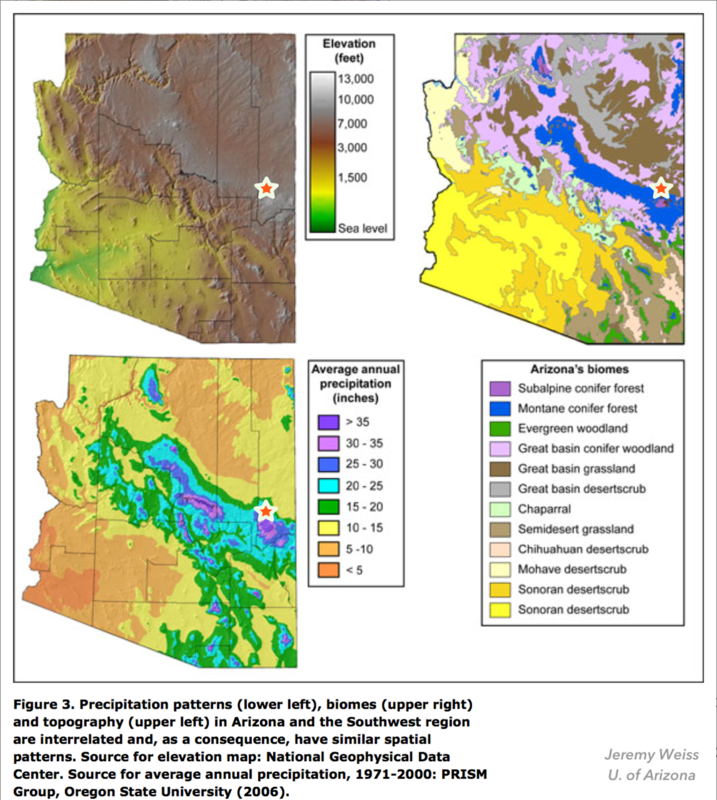 The local ecology of Arizona extends from desert scrub, chaparral and lush riparian zones at lower elevation, to the arid mid-elevation piñon/juniper/manzanita forest (pink on biome map), to vast stands of Ponderosa pine and oak and aspen in the montane conifer forest (blue), to the subalpine mixed-conifer forest composed mostly of firs and spruces (purple), to near-tundral habitat at the very highest elevations, where little more than bristlecone pines and lichens may be found. The high country of Arizona usually sees relatively heavy winter snows. 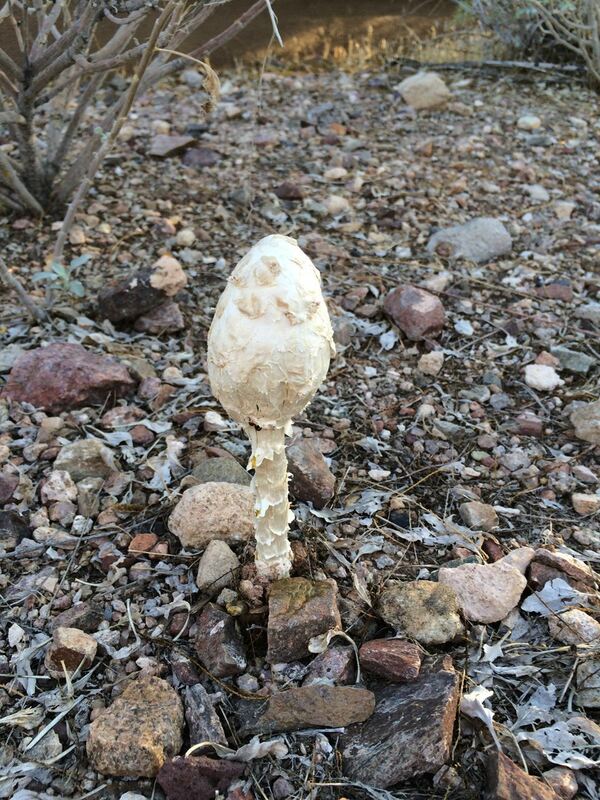 Occasional winter rains in the desert areas can produce ephemeral fruiting of secotioid species and a few edibles such as oyster mushrooms and Agaricus bitorquis. Morels are found between March and May, following the snowmelt. A dry season follows in May and June, but typically by mid-July, the summer monsoons have begun. During the monsoons, moist air from Mexico blows up from the south. When it hits the mountains and is lifted abruptly upwards from the desert floors, extremely violent thunderstorms and heavy rains result. it is not uncommon for 20 inches of rain to fall in higher elevations of the White Mountains during the late summer/early fall monsoon. This phenomenon, and the fungal growth it elicits, is usually finished in our mountain terrain by mid to late September-- but not always. 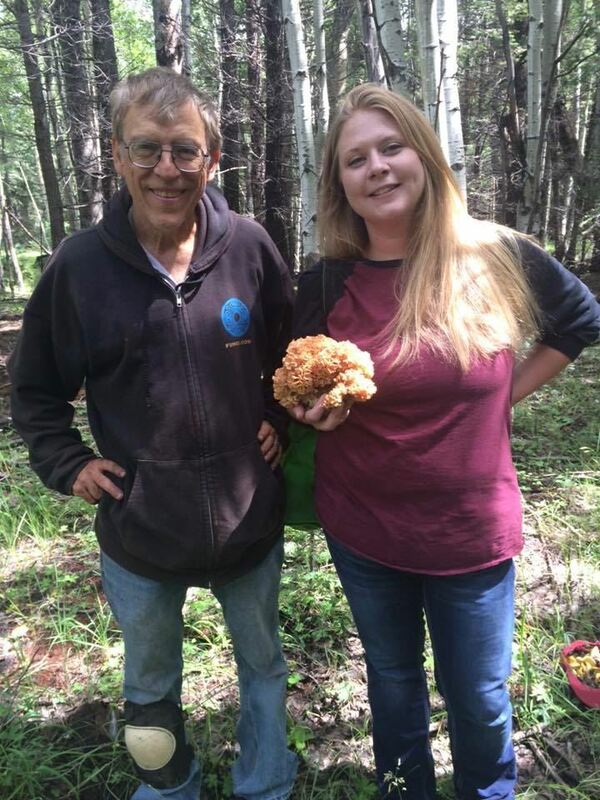 October 2014 will be long remembered for the prolonged, heavy, warm rains that sparked an enormous fruiting of morels where forest fires had burned in the early summer. To a greater degree than most other places, the rainfall in the Arizona mountains can be quite spotty. It is often necessary to study rainfall maps closely and adjust our foray destinations to the areas of heaviest rainfall to maximize our chances of finding fungi. The past winter was wet in the northern White Mountains near our hotel. Snowfall was 120-150 percent of normal in this area. Farther south and east, it was closer to normal or even below normal, but there is nonetheless hope for a good season even there. The Climate Prediction Center of the NOAA is currently forecasting summer precipitation to be normal to wetter than normal in Arizona. 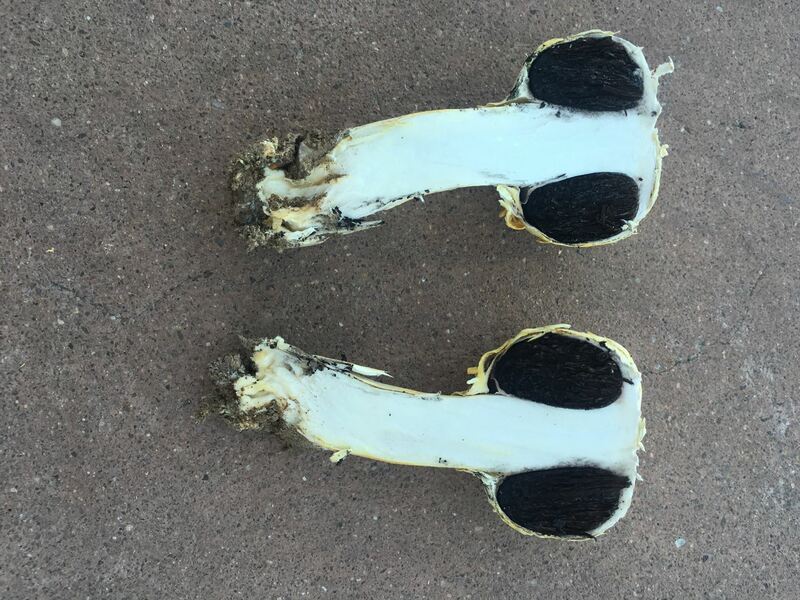 The mushrooms found in Arizona differ in some respects from the rest of the Western U.S. While we see many of the same species found in California and the Rocky Mountains, the state's fungi also have much in common with the mycoflora of Mexico and Eastern North America. There are more than 1,200 species of macrofungi that have been collected here, and it is routine to see 100-200 species on any given foray at the peak of the season. The "Sun Caesar," Amanita "cochiseana" nom. prov. 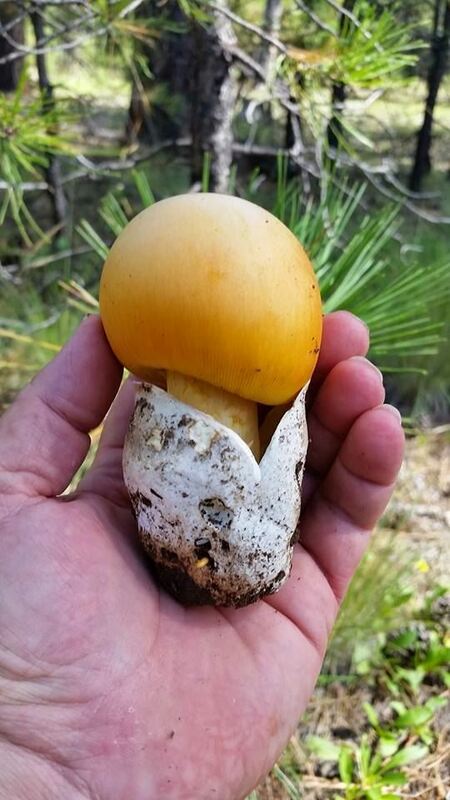 This is a conspicuous, common, and delicious Southwestern variety of the Caesar's amanita. It more closely resembles the true European Caesar's amanita than the other North American varieties, and is said to taste more like it too. 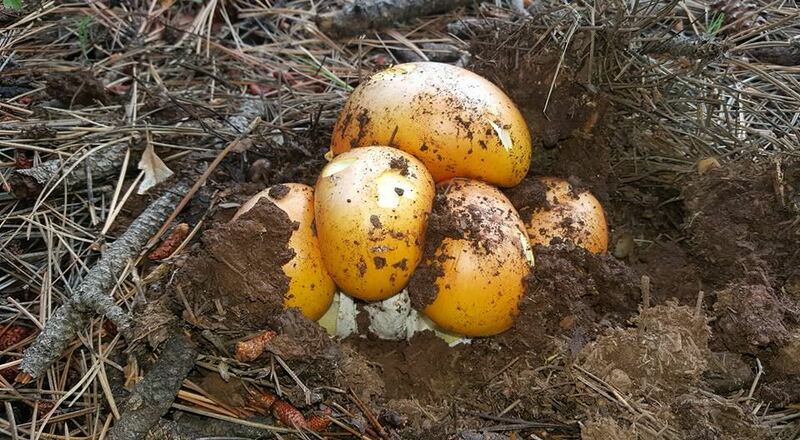 The Barrows' bolete or white king bolete, Boletus barrowsii, is highly sought for the table and relatively common under Ponderosa pine in the Southwest. You can see it in our logo at the top of the page. The Rocky Mountain Red-Capped King Bolete, B. rubriceps. Locals call it the "Ruby". Blind taste tests suggest it is the best-tasting of all North American porcini. 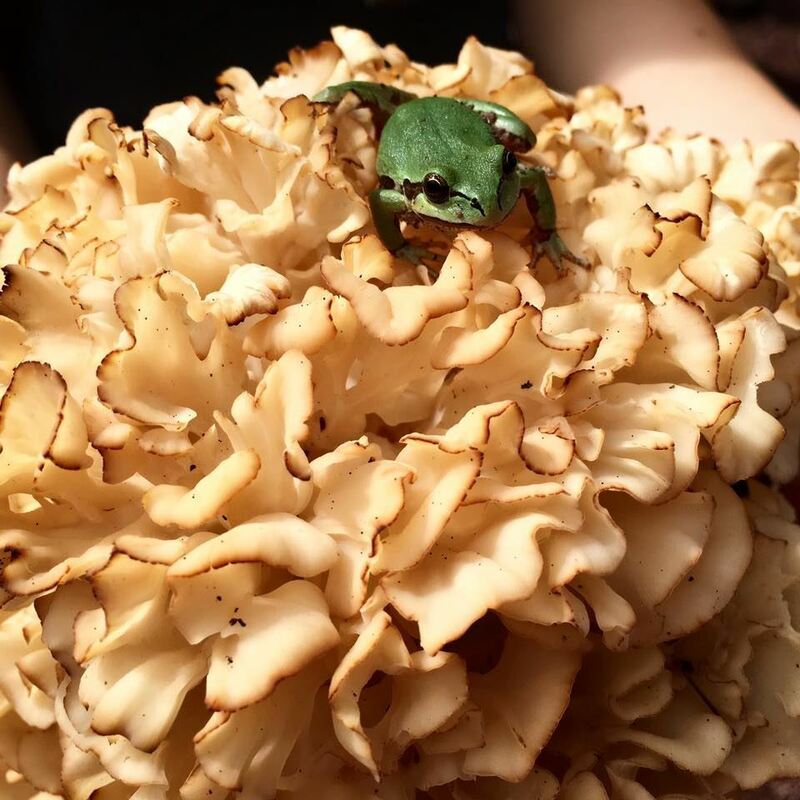 Arizona's own version of the cauliflower mushroom, Sparassis americana f. arizonica. One can occasionally find half a dozen per day in the White Mountains when they are fruiting. Eastern species such as Gyroporus cyanescens and Harrya chromapes are found here in their most southerly and westerly distributions. Xeric/secotioid species in such genera as Battarea, Montagnea, Podaxis, Agaricus, Tulostoma, Geopora, and Pisolithus are found throughout our deserts. A unique, unnamed "Golden Grisette", with a gorgeous metallic glow like a gold nugget. This is by no means the only undescribed species here. Arizona has a number of other Amanita, Agaricus, Boletus, Cortinarius, Russula, and many other species that have never been published and may interest the more scientifically minded among us. The best place to see the full variety of what we have is in the photo albums of the Arizona Mushroom Forum Facebook group, especially the annual photo contest albums. At a minimum, you'll want to bring a knife, basket, whistle, compass, shoes or boots appropriate for rough terrain, and layered clothing suitable for warm, cool, or rainy weather. Carry plenty of water when in the Arizona backcountry, even up in the cool mountain forests. A hat and sunscreen are strongly recommended, for the Arizona sun is relentless at these high elevations despite the pleasant weather. Insect repellent is not a bad idea as there are a few gnats and mosquitos around dawn and dusk, but those who come here from other climes will be pleased at how few bugs will bother you while out in the field. I can't remember the last time I saw a tick, and killer bees can't survive the winter at these elevations. However, we do have yellow jacket wasps, so those who are sensitive to stings will want their epi-pens. There is also a myth that we have no poison ivy, but a few patches do exist. We suggest the Avenza Maps app for iPhone or Android. With it, you can download a GPS-linked map for your smart phone that is usable even if there is no cell signal. The Forest Service provides good quality road maps, or you can download topo maps, satellite images, or property boundaries for free or at a modest cost. 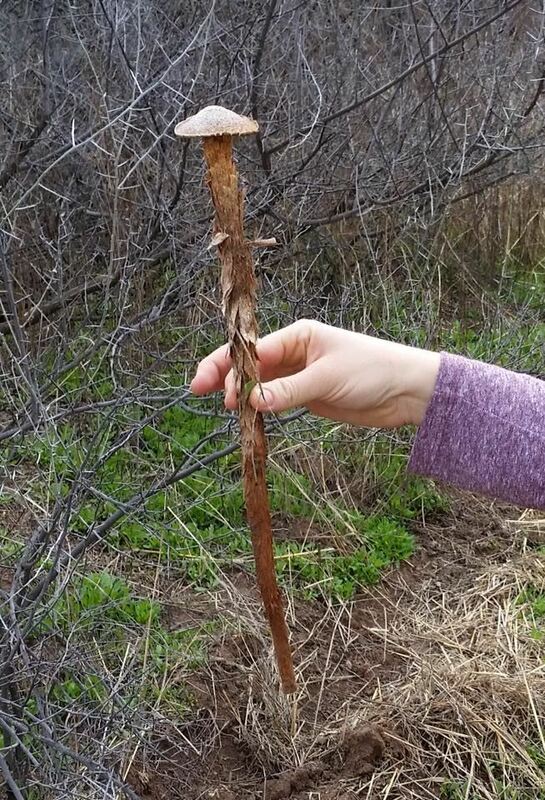 You can use it to mark the location before we go out in the woods for an easier return to our parking spot, or save a marker showing where you found a honey hole of porcini. 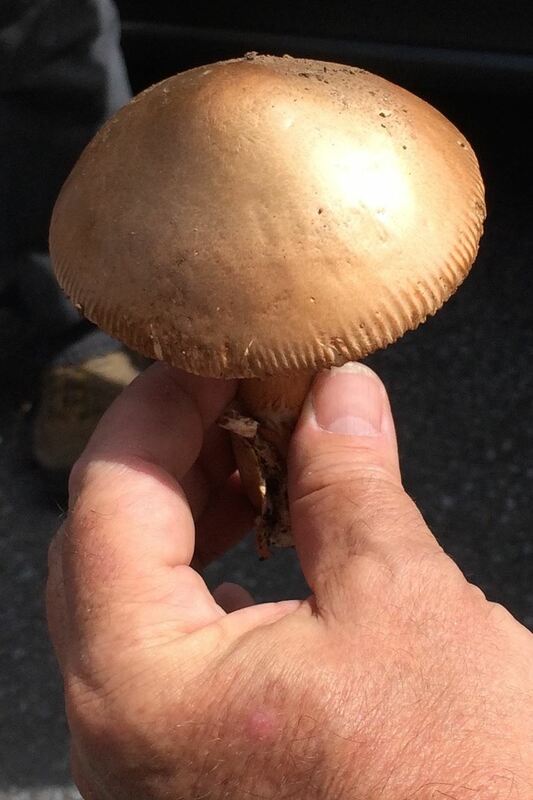 The Arizona Mushroom Forum blog has a more complete checklist for mushroom hunting in Arizona. Fishing enthusiasts will want to bring their gear. Our hotel is walking distance from the excellent trout fishing at Sunrise Lake. Many other lakes and streams in the area provide top-quality fishing experiences. Serious trout chasers may wish to try for the Arizona state fish, the golden Apache Trout (Oncorhynchus apache). Teenagers may enjoy the zip line and mountain biking at the Sunrise ski area during the summer. Horseback rides, jeep or ATV rentals, boat and canoe rentals, and birding expeditions can all be arranged. There is a casino on the reservation at Hon-Dah. History buffs may want to visit Fort Apache, Kinishba Ruins, or the oldest continually inhabited community in America at Walpi Village. Coming to the foray or going home, make time to pass through the Four Corners region to see some of the most spectacular and famous scenery in the entire world, including the Grand Canyon, Monument Valley, Canyon de Chelly, Zion National Park, and Mesa Verde. If you wish to look for a roommate or someone to ride-share to the meeting, or want to discuss anything else about the event with others who are planning to attend, please go to the 2017 NAMA/AMS Foray Forum on this website and leave a comment. You can also comment on the Facebook event for this foray that has been posted on the AMS page.